No one said it’d be easy to rescue the President’s daughter from a Spanish village populated by parasite-infected monsters - but “Resident Evil 4” damn sure makes it fun. As U.S. Agent Leon Kennedy, you must shoot your way through chainsaw-wielding maniacs, outrun rolling boulders a la Indiana Jones and slay a sea monster the size of a 747 - with a harpoon. But that’s only the first of five chapters. Leon’s search for the first daughter takes him deep into a splendorous medieval castle, where he battles a small army of robed religious fanatics wearing skull masks and brandishing maces. Top that, Chuck Norris. The sky-high suspense quotient of “Resident Evil 4” makes the game an unwise choice for pregnant women or men with a genetic history of heart disease. You could be comfortably strolling through a castle hallway, pondering your next move, when bam! - an unseen monster thrusts one of its razor-sharp tentacles through the wall and at Leon’s torso. A screen will flash that prompts you to press a particular button to avoid getting impaled, but a split-second delay could cost you your life. Leon can be maneuvered through his environments with remarkable precision - you can even weave him through a swarm of enemies and emerge unscathed. Mastering these controls in “Resident Evil 4” requires no longer than half an hour of play. The only annoyance is the absence of a jump button, but an all-purpose action button enables you to hop over fences or crates with no difficulty. Combat controls are equally adaptive. Every firearm in the game projects a laser onto potential targets, which makes aiming a ridiculously easy task. But the articulate targeting system provides a fun challenge. If you shoot an enemy in the knee, it buckles and he falls down. A shot to the arm can disarm him. Shoot him in the head, and it explodes - naturally. Anyone familiar with the “Resident Evil” series might scratch their head over one small absence in “Resident Evil 4” - the zombies! Instead of the undead, Leon faces hordes of Ganados - Spanish farmers infected with a parasite that looks like a tailed sea crab. Although they have the same vacant stare as zombies, the Ganados also talk and swing pitchforks at you. 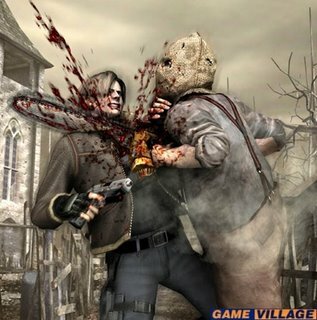 They’re far more terrifying than zombies - and it’s this abundance of terror that makes “Resident Evil 4” triumph. The final boss: The best-looking game yet in the “Resident Evil” series delivers the heart-stopping suspense and action-packed adventure for which the franchise is known.